Not quite ready to book a cabin yet? Have questions? Please contact us today. And don’t wait too long, the cabins are filling up fast! Call: 740-216-4790, send us a message using the email form, or contact us on Facebook. Our Carefree Cabins are located within 10 miles of all the most popular Hocking Hills parks. And just a short distance to other local attractions such as shopping, restaurants, wineries, distilleries, and a variety of outdoor adventure activities and entertainment. 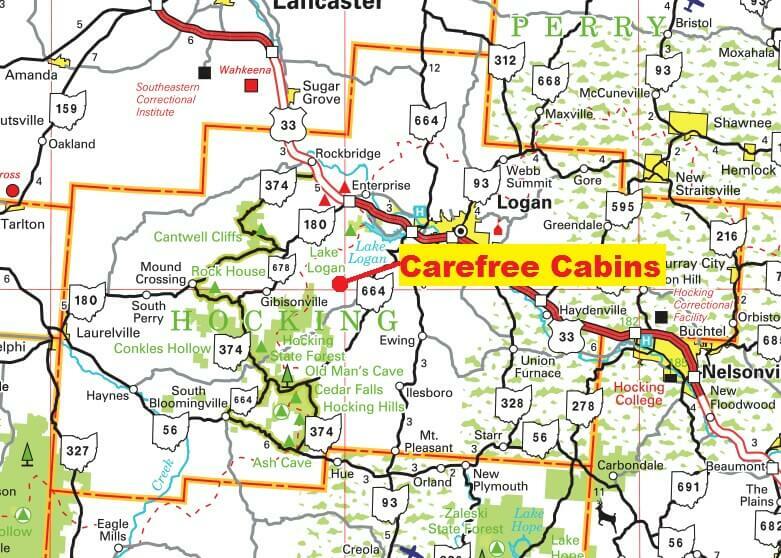 The map to the right shows the general area where all cabins are located (red dot) in relation to local parks and roads. All our cabins are within a ~1 mile radius of each other.